February 2 (Bloomberg) -- The U.S. should suspend talks to give economic aid to Mongolia following the imprisonment of U.S. citizen Justin Kapla, the American Chamber of Commerce in Ulaanbaatar said today. A suspension would be the first direct financial impact felt in Mongolia after a court sentenced Kapla, a native of Elk River, Minnesota, and two Philippine nationals to between five and six years in prison on the charge of tax evasion. The case has drawn condemnation from foreign observers and members of the Mongolian government. The Millennium Challenge Corporation, a U.S. foreign aid agency, gave Mongolia $285 million over five years in a first agreement that concluded in September 2013. The MCC forms "partnerships with some of the world's poorest countries, but only those committed to good governance, economic freedom, and investments in their citizens," according to its website. The suspension of talks on a second round of aid should commence immediately, said AmCham Chairman Jackson Cox. Mongolia's gross domestic product was $11.5 billion in 2013, according to the World Bank. The "award requires that certain thresholds toward transparency and justice and corruption are met," Cox said by phone. "As long as a U.S. citizen sits in a Mongolian prison based on a flawed trial there should absolutely be an immediate suspension on the negotiations." U.S. ambassador to Mongolia, Piper Anne Wind Campbell, who attended the court case that ended Friday, said there were interpreting problems at the trial. Oyungerel Tsedevdamba, a Mongolian member of parliament, called the sentencing "too unjust and unbelievable." The prosecutor, G. Gereltuya, declined to comment on the outcome when reached by phone today. Kapla, Hilarion Cajucom Jr and Cristobal David, all former employees of SouthGobi Resources Ltd., have been detained in the country since an investigation into the company began in 2012. SouthGobi has denied the claims of tax evasion and said today there was "a complete lack of evidence to support this harsh verdict," promising an immediate appeal against the court's decision. Paul Thomas, Public Affairs Officer for the U.S. embassy in Ulaanbaatar, declined to comment on whether the U.S. had considered suspending aid negotiations. Munkhtur Tserendoo, spokesman for Prime Minister Saikhanbileg Chimed, declined to comment on the matter when asked by phone. A call to Minister of Foreign Affairs Purevsuren Lundeg went unanswered. Philippine foreign affairs spokesman Charles Jose said the government is studying the implications of the case and will comment in due course. February 2 (bne) A US businessman has been convicted of tax evasion in Mongolia, in a controversial case that has worried foreign investors at a time when the country is struggling to woo them back to exploit its natural resources. Justin Kapla, a US citizen, together with his employees Hilarion Cajucom Jr and Cristobal David of the Phillipines, all of whom used to work for SouthGobi Resources, were sentenced to between five and six years in prison on January 30, after a legal process during which they were banned from leaving Mongolia for two years. Mongolian judges twice returned the case to the prosecution because the evidence was too weak. Independent Mongolian Metals & Mining Research reported to clients in an email that close advisors to Prime Minister Ochirbat Chuluunbat had called the case an "…unacceptable violation of human rights. Tax evasion, if proven by independent audit, is a case against company, not an individual." Mongolia's mistrust of foreign investors taking over its multi-billion dollar mineral deposits have sometimes led politicians to side against them. Hostile rhetoric and unfavourable legislation on investment contributed to the 71% decline in foreign investment in the year to the end of November in 2014 compared with the same period in 2013. "The government is trying to encourage investment, but what the tax authorities together with police and courts are doing is another thing," said a Mongolian legal professional who has experience with tax disputes in Mongolia but could not comment on this case specifically. He did not want to be named out of concern that speaking out against the decision would make him a target of the government. 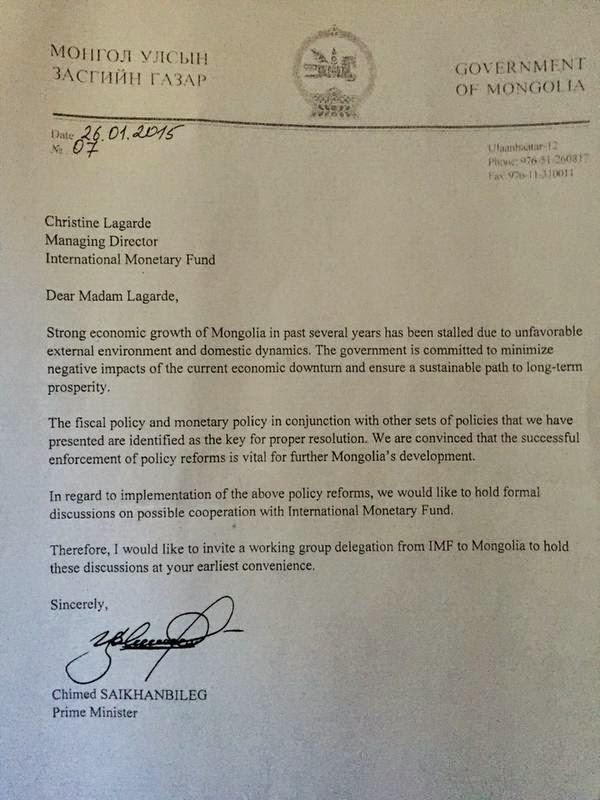 One concern has been Mongolia's use of travel bans while conducting investigations. Each of the former employees had travel bans that prevented them from leaving the country since May 2012. Kapla registered his case with the UN Human Rights Committee after he was unable to leave Mongolia despite the serious illness of family members abroad. Before the verdict, Kapla told bne IntelliNews that the Independent Authority Against Corruption had broken protocol by leading a tax audit into the company, when only the tax authority could do this, he claimed. He also said that the case was little changed from the one handed back to the prosecution for lack of evidence, although the sum was far less than the original 230bn tugrik ($118.3mn). Taking the case into a criminal court is also unusual, said the lawyer. "There's a separate court that does tax dispute," he said. "This may have been a tax dispute and the jurisdiction was with the administrative court, but somebody decided to take it through to the criminal court and that's the end result." The lawyer said he could recall three other tax cases that were turned into criminal investigations in recent years, including one against Standard Bank employee Chris Bradley and another against Canadian exploration company QGX. The crackdown on foreigners accused of tax evasion may spoil government efforts to draw investors to Mongolia. This year the country is making 10.1 million additional hectares available for exploration. It is the first time exploration licenses will be issued since a moratorium in 2010. The government is also making positive strides with the country's largest existing mining assets. It is asking for $4 billion from investors entering a strategic partnership with state-owned miner Erdenes Tavan Tolgoi. Another $4bn is on the way if the government can resolve disagreements with Anglo Australian miner Rio Tinto over the Oyu Tolgoi copper mine. Ulaanbaatar, February 2 (MONTSAME) At the Stock Exchange trades on Monday, a total of five million 050 thousand and 690 units of 28 JSCs were traded costing MNT 526 million 908 thousand and 671.00. "E-trans logistics" /five million 004 thousand and 608 units/, "Olloo" /10 thousand and 250 units/, "Khokh gan" /10 thousand and 200 units/, "Remikon" /10 thousand and 140 units/ and "Genco tour bureau" /9,136 units/ were the most actively traded in terms of trading volume, in terms of trading value were "E-trans logistics" (MNT 500 million 437 thousand and 760), "APU" (MNT nine million 705 thousand and 100), "Tavantolgoi" (MNT three million 366 thousand and 269), "Talkh chikher" (MNT two million and 064 thousand) and "Gutal" (MNT one million and 859 thousand). 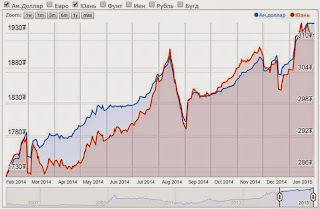 The total market capitalization was set at MNT one trillion 388 billion 384 million and 363. The Index of Top-20 JSCs was 14,370.46, increasing 79.83 units or 0.56% against the previous day. February 2 (gogo.mn) Securities market open door event will be held during February 6-7th at 10AM-5PM. February 2 (news.mn) Minister of Food and Agriculture R.Burmaa and Deputy Minister B.Batzorig visited the Agricultural Stock Exchange of Mongolia for an update on its activities. The Agricultural Stock Exchange opened in 2013. The market has become a transparent market for herders and producers, and has created conditions for establishing the actual value of agricultural products and reduced expenses through its business activity. For that reason, several trades of agricultural products at market prices have been carried out, not only on the domestic market, but also in foreign markets. In the last two years, the trade of the Agricultural Stock Exchange has reached 971.4 billion MNT. Starting next year, the Agricultural Stock Exchange is going to trade fur and raw materials, and it is also preparing to trade wheat products. Preparations for launching the trade of fur and raw materials are now underway. As of January 29, 2015, the Agricultural Stock Exchange has organized 11 trades and traded 557.2 tons of goat wool, 11 tons of cashmere wool, 662 tons of sheep wool, and 26 tons of camel wool, for total trade valued at 13.7 billion MNT. February 2 (Bloomberg) -- Mongolia's FX reserves fall 26.6% y/y, according to data on the Bank of Mongolia website. 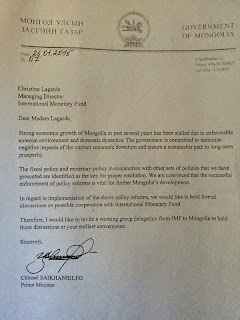 Mongolia PM asks IMF's Lagarde to Send Delegation to Discuss "Possible Cooperation"
February 2 (gogo.mn) Let's Choose Development Path for Mongolia 2015-2016 voting initiated by Government of Mongolia is collecting votes through SMS to special number. By 3PM of the first day of the voting total of 1,669,756 users have been approached and 36,967 votes have been submitted. Voting SMS is being sent to the citizens in batches. Votes of some of the residents who have sent their votes prior to the SMS received, their votes are eligible as well and their second votes won't be eligible as the first vote will count. Voting will continue until 10PM February 3rd. Mongolian Citizens are to vote whether the country should develop its bigger projects such as OT vote 1, or whether the country should choose saving on its expenditures and stabilize the exchange rates vote 2. The voting should be sent to 15151111 special number through cell phone. Ulaanbaatar, February 2 (MONTSAME) The Speaker of the State Great Khural (parliament) Z.Enkhbold addressed 2015 annual meeting of UB Mayor, aimag governors and heads of Citizens' Representative Khurals (council) held Monday in the State House. Co-organized by the Presidential Office, the Parliamentary Office and the Cabinet Secretariat, the meeting has brought together Ts.Elbegdorj, the President of Mongolia; S.Bayartsogt, head of the Cabinet Secretariat; Mayor of Ulaanbaatar city, governors of aimags; and heads of the Citizens' Representative Khurals of localities (local councils). Mentioning about a formation of the new cabinet, the Speaker emphasized that the meeting of local councils' authorities is running for the first time after formation of the new cabinet. He presented to the attendees the 2015 state budget and the budget clarification, and then said the local authorities should focus attention to make budget clarifications based on realistic analysis and augmenting the budget profits by maintaining the most proper list. Then the Speaker heard views from the participants. The annual meeting aims to take general directions and understanding about the 2015 basic guideline for socio-economic development and implementing the budget, to determine functions of the governors and heads of local councils and to establish cooperation contracts between the cabinet members and the local authorities. ULAANBAATAR, January 30, 2015 – A new agreement with Mongolia provides $22.7 million for the third phase of a project supporting the country's effort to empower rural communities in a more diversified and modern economy, the World Bank announced today. The Third Sustainable Livelihoods Project (SLP III) will help Mongolia further implement the Integrated Budget Law of 2011 that gave rural communities a greater role in the government-funding process. SLP III also supports local economic development through the "Soum Program" that promotes investments for private sector growth in the more than 300 soums – or local administrative districts – throughout the country. Mongolia's Minister of Finance, D. Erdenebat, signed the credit agreement today with Bert Hofman, the World Bank's Country Director for China, Korea and Mongolia. "The adoption of the Integrated Budget Law was a major milestone for empowering rural communities and provides a transparent mechanism for fiscal transfers for local development," Hofman said. "With this in place, the SLP III project will build the capacity of local governments and communities to manage local development initiatives." Since its inception in 2002, the three-phase Sustainable Livelihoods Program has backed efforts by the Mongolian government and the international community to modernize a mostly rural and under-developed economy. The first phase, from 2002-2007, demonstrated new approaches to make a living in rural areas by establishing community development funds that helped introduce the concept of community participation to identify needed investments such as pastoral risk management. In the second phase, from 2007-2013, an expanded program led to community development fund financing for more than 6,000 sub-projects, mostly for investments in education and health. Now SLP III will boost continued implementation of the Integrated Budget Law, government decentralization policy, and other reforms. It will build capacity for the government Local Development Funds, which finance investments in infrastructure and services at the local level. Under the budget law, LDF allocations get decided each year through a robust participatory process at the community level. The project also will bolster the Soum Program, which offers incentives to local government entities that adopt participatory processes to reflect local needs and priorities in their planning, budgeting, implementation, monitoring and evaluation. Funding for the SLP III Project comes from the $22.7 million credit from the World Bank Group's International Development Association (IDA), and an $11.4 million grant from the Swiss Agency for Development and Cooperation. Can Mongolia's Digital Revolution Help Meet Service Delivery Challenges? January 28 (The Asia Foundation) Last month, Mongolia celebrated the 25th anniversary of its democratic revolution, a moment that would catapult the country's transformation from a communist regime to a dynamic power in the region. But more recently – and more quietly – the country has also been undergoing a digital revolution. In the World Economic Forum's 2014 "Network Readiness Index," Mongolia ranks 61 out of 148 economies in terms of its ability to leverage ICT to boost competitiveness. With the lowest population density in the world, internet penetration has been understandably low in Mongolia. But this rate has been steadily increasing over the last couple of years facilitated by the rapid expansion of the telecommunications network and in particular the increase of (Android) mobile phone use. Increasingly, ICT is also being recognized an important enabler for innovation and development as well as potential solutions to governance and transparency issues and service delivery challenges both in Mongolia's urban and remote rural areas. The Ulaanbaatar City Municipality has been ahead of the curve in utilizing ICT innovations to advance governance reform. In response to President Elbegdorj's "From Big Government to Small Government," initiative, the City Municipality launched the "Smart Ulaanbaatar" program in March 2014. The program, which focuses on six "smart" components – governance, economy, service, people, environment, and well-being – will utilize new technology solutions to improve the quality of life the citizens of Ulaanbaatar city, home to almost 50 percent of the total population, and will be implemented in three stages until 2020. The city has already started some of these smart initiatives including the establishment of a citizen feedback call center using ICT software to categorize complaints and forward these to relevant departments, city vehicle e-tax collection, and a new online Android application that provides data publically on ongoing construction projects. The Asia Foundation has been supporting the Ulaanbaatar City Municipality in particular in the areas of governance and service delivery, and in 2014, we partnered to improved transparency by developing an integrated database containing over 48,000 key decisions and city legislation made by the Capital City Citizens' Khural, the governor's office, and the city's nine districts and agencies. We also partnered to help resolve one of the most publicly disputed issues in Ulaanbaatar – land permission and issuance – by digitizing over 150 land demarcation maps of which a selection has been uploaded onto the city's land and property office website. Together with the city, we established a community mapping website as an interactive resource for citizens and city officials to find information and download maps for advocacy and planning purposes on 11 different indicators about the accessibility and availability of public services in the city's sprawled out ger districts. Most recently, we have been working with the city to develop an electronic customer database on solid waste collection, which will be linked to Ulaanbaatar's service center to enable ger area residents to receive information and provide direct feedback on collection services via SMS. One of the main challenges in further developing ICT solutions is the still limited access to the internet by much of the population, especially of the residents in Ulaanbaatar's surrounding ger districts and in the countryside. In 2013, Ulaanbaatar established 99 free Wi-Fi zones across the city, but still coverage is not wide enough. Therefore, in December 2014, the Mayor and Capital City Governor, Mr. Bat-Uul, signed a Memorandum of Understanding with Cisco, which includes further expansion of its Wi-Fi network to all city residents, including the nearly 60 percent who live in the ger areas. Other areas of cooperation include good governance solutions based on cloud technologies, including a data center that will serve as a general data network of all public services and of information about education, health and other industries, the establishment of an e-governance network that can connect all administration units of Ulaanbaatar to the general network, and Cisco's Internet of Everything (IoE) software to collect the population data to inform planning on public safety, environmental sustainability, and productivity. A smart education program will provide trainings and lessons for schools located in remote areas of the city, using WebEx technology video instruments. In October, the Ulaanbaatar City Municipality also signed a MoU with Google to help strengthen the city's economic competitiveness and develop tourism through closer collaboration with Google Maps. The city and Google launched Google Street View of Ulaanbaatar, which allows users take a virtual "walk" to view scenes of documented streets, avenues, squares, museums, restaurants, and buildings on Google Maps. However, one of the main challenges in urban planning and service delivery has been the lack of a comprehensive accurate and detailed map of Ulaanbaatar that can show roads especially in the ger areas, where many roads are unpaved. Building upon our existing community mapping project, the Foundation has been partnering with the City Municipality of Ulaanbaatar to use remote sensing technologies and open source tools and services like OpenStreetMap (OSM) to develop a more complete and accurate online, open, and free map of Ulaanbaatar. DigitalGlobe recently granted the Foundation more recent and higher resolution satellite imagery for tracing in OSM. Mapbox, which provides a powerful and diverse platform for the creation of custom online maps, has processed the raw satellite imagery to prepare it for use in OSM and is hosting the resulting map tiles. There are now more than 2,000 square kilometers of high-quality satellite imagery of Ulaanbaatar available for viewing and editing in OSM. We also collected even higher-resolution imagery of Ulaanbaatar's ger area road and elevation data using unmanned aerial vehicles (UAVs). To ensure that the city has the capacity to use the data provided by the new imagery to inform policy making and planning makers, the Foundation last week conducted an advanced GIS training course for city planners providing a platform to show their analytical skills while learning about more innovative, lower-cost and faster ways of improving urban planning in Ulaanbaatar. While ICT tools alone can't solve Mongolia's toughest governance challenges, the city's willingness to embrace innovative partnerships and its determination to find solutions just might be what it takes. Tirza Theunissen is The Asia Foundation's deputy country representative in Mongolia and can be reached at tirza.theunissen@asiafoundation.org. The views and opinions expressed here are those of the individual author and not those of The Asia Foundation. February 2 (IndianTelevision.com) Mongolia has launched a Media Ethics Council, which will he headed by Mongol TV CEO Nomin Chinbat as chairperson. Over the past year, journalists, editors, broadcasters, business owners and academia came together as an informal group called The Media Council Club of Mongolia and evolved into the official Mongolian Media Ethics Board. The Council will protect citizens against unethical reporting in the media and raise awareness about the importance of truthful reporting while monitoring the implementation of an ethics code for journalists. Lastly, the council will mediate between dissatisfied readers and the media. The Council consists of 15 board members and a chairperson, while the Ethics Committee will have 15 members each in two divisions – broadcast and radio; print and online media who will mediate on complaints made by the public about the media. The Freedom House has labeled Mongolian media as "partly free" in 2014. There have been 297 civil and 16 criminal cases recorded from 1999 to 2011 in Mongolia. "Mongolia's media industry is changing by taking a positive step forward, and creating the first-ever ethics council. I am honoured that my Mongolian colleagues put their trust in me as their first chairperson. The illustrious Board and I will strive to ensure all Mongolian journalists and broadcasters utilise ethical and high quality standards. We want Mongolian citizens to trust our media and know that we are reporting in a truthful and unbiased manner," said Chinbat. Scholars in global media hail the importance of self-regulation in media and how it plays a pivotal role in upholding freedom of expression and protecting citizens from media misconduct. Former communication regulator, now media NGO leader Tamir Ukhnaa said, "The newly set up ethics council will help journalists from criminal prosecution while defending public's right to free and unbiased reporting and overall raise the bar of reporting quality in Mongolia." February 2 (news.mn) Officials led by the Minister of Foreign Affairs of Mongolia, L.Purevsuren, visited the Altanbulag-Khiagt border checkpoint last weekend. They were introduced to developments and activity at the border checkpoint. As of the end of 2014, Mongolian and Russian citizens have been allowed to travel across the border without visas. In comparison to the same period last year, passenger transportation has increased by 36 percent at the checkpoint and vehicle transportation by 23.1 percent. As of January 2015, passenger transportation increased by 23,226 (88.5 percent) and vehicles by 5,242 (54 percent). The Khiagt border checkpoint and customer organization checks five to seven vehicles per hour. Due to this timely procedure, passengers have to wait patiently in a long queue to cross the border. One vehicle may have to wait up to 12, which has negatively influenced satisfaction at the border port regarding the fulfillment of procedures. During the visit of the Minister of Foreign Affairs, representatives in Buriatiya from the Russian Ministry of Foreign Affairs participated in the visit and discussed the problems facing the Altanbulag-Khiagt border checkpoint. The Minister pointed out that the difficult issues faced by the border checkpoint will be resolved in the near future and that he would present these issues to the Cabinet for discussion. He assured that measures will be taken to safely travel and for the protection of rights of passengers travelling through the Altanbulag-Khiagt border checkpoint. Ulaanbaatar, February 2 (MONTSAME) In frames of a working tour to Nalaikh district, the Speaker of parliament Z.Enkhbold last Saturday legged the Mongolia-Germany joint university of minerals and technologies. Mr Enkhbold got familiarized with the university's campus which was put into use in 2014 and equipped with European-standard laboratories, class rooms, a library and a fitness room. The rector N.Dorjderem briefed about the university, saying that it made first enrolment in 2013, and 66 students are studying at the university in the academic years of 2014-2015. As of present, the university is running the bachelor's degree training for the professions of mining processing engineering, mechanical engineering and environment engineering, the rector said. With a slogan of giving the world-standard education in Mongolia, all the lessons are held in English by Mongolian, English and German teachers. Furthermore, more advanced lessons are taught by teachers and professors from German universities, Dorjderem underlined. Scholarships are being granted from the metallurgical plants of Oyu Tolgoi and Darkhan, the Anglo-American, MAK and MSM to the students with the highest grades. About 30% of the students have taken the scholarships, the rector said. After the presentation, the Speaker held a meeting with the university's teachers and students, responding to answers on the relevant issues. The students talked about an establishment of the "Morning Club" and the "English Day" for English language week, whereas the teachers emphasized an importance of amending the legal environment for the higher education sphere due to an establishment of the very first intergovernmental joint university in Mongolia. The university has put forward a goal to become one of the Asian top universities in accordance with a state policy on education, the teachers pointed out. During the working to Nalaikh district, the Speaker Z.Enkhbold was accompanied by L.Gantomor MP, the Minister of Education, Culture and Science; L.Bold MP; Gerhard Thiedemann, the Ambassador Extraordinary and Plenipotentiary of Germany to Mongolia; and other officials. February 2 (infomongolia.com) On February 02, 2015, the President of Mongolia Ts.Elbegdorj received in his office, the Ambassador Extraordinary and Plenipotentiary of the United Kingdom of Great Britain and Northern Ireland to Mongolia, Mr. Christopher Charles Stuart due to end of his mission in the country. In his meeting with the Ambassador of the United Kingdom, the President of Mongolia noted, "You have worked in Mongolia as an envoy for three years and during this period you have greatly contributed to the development of Mongolia-UK relations, in which I would like to express gratitude on behalf of the people and on my own. Mongolians acknowledge that the UK is one of the western countries first recognized Mongolia's Independence. The two countries established the diplomatic relations in 1963 and been maintaining the friendly ties so far. Also, it is notable that the two states are planning to boost collaboration in the mining, railway, stock exchange, despite, the economic partnership is being developed considerably. I wish you success in your further endeavor, Mr. Stuart". February 2 (infomongolia.com) Today on February 02, 2015, the President of Mongolia Ts.Elbegdorj received in his office, the Ambassador Extraordinary and Plenipotentiary of the Lao People's Democratic Republic to Mongolia, Mr. Bounnhang Xaysanavong due to end of his mission in the country. During the meeting with the Ambassador of the LDPR, President of Mongolia noted, "We greatly evaluate the contribution in the development of relationship made by the Honorary Ambassador during the past three years. I would like to recall when was participating in the IX Asia-Europe Meeting (ASEM) Summit in Vientiane in 2012, I had met with the state head and other dignitaries of the Lao PDR. Mongolia to host the ASEM Summit in 2016 and in this regard, I hope the top-level delegates would participate in this event. Also, we will implement the tasks discussed between the parties and will pay particular attention on cooperation issues in agriculture and industry spheres. Please convey my warm greetings to the President of Lao and the people and wish you success in your further endeavor, Mr. Xaysanavong". January 31 (Malaysia Chronicle) DAP will call for an all-party Parliamentary Committee to inquire into all unresolved public interest questions on the Altantunya Murder Case when Parliament reconvenes on March 9. The latest news is that Corporal Sirul Azhar Umar has refused to return to Malaysia from Australia to face the gallows. Sirul, the ex-elite force police commando who, together with Chief Inspector Azila Hadri, had been sentenced to death for the 2006 murder of Mongolian model Altantuya Shaariibu, is now detained at Sydney's Villawood immigration centre. Nobody is surprised that Sirul, who had belonged to an elite police squad, the Special Action Unit (UTK), has refused to come back, as he is clearly nursing a great sense of grievance and injustice for his dastardly deed of murdering a defenceless Mongolian woman as he must have believed at the time he was performing the highest act of "loyalty" in the interest of the state, and now to be condemned as a "rogue policeman" and having to face the gallows without any "protection" from his "patrons" for his act of "loyalty". Malaysians, including conscientious and responsible policemen and women, who comprise the overwhelming majority of the police personnel, are outraged by the blabbering of Abdul Razak Baginda, who was acquitted of abetiting in the murder of Altantuya without his defence being called, for instance, when he maligned the 130,000-strong police force when commenting on the motive for the killing of Altantuya: "Only the two policemen know. Rogue police do kill people, like in so many remand cases". The Inspector-General of Police, Tan Sri Khalid Abu Bakar objected meekly to Abdul Razak Baginda's aspersions and maligning of the police force, protesting that Razak's "blanket statement in unacceptable", when Malaysians had expected a more forceful response from the IGP to Razak's insinuation that all cases of custodial deaths were due to police brutality. But even more pertinent, Malaysians had not expected the IGP to be so supine as to virtually accept Razak's cop-out account that it is impossible to know the motive for the murder of Altantunya. It is a gross dereliction of duty on the part of the Inspector General of Police that he is not interested in finding out why two member of the elite police force, one a Chief Inspector and the other a Corporal, murdered in cold-blood a defenceless Mongolian woman, using C4 explosives, when both did not know the victim and had no logical motive or reasonable cause for committing the murder. Although the courts did not establish the motive for the murder of Altantunya, the least a responsible and conscientious IGP should do after the completion of the murder trial would be to launch a thorough and wide-ranging inquiry to ascertain why two elite policemen, tasked with protecting people's lives, had murdered in cold blood defenceless Altantuya? In his confession to the police in the form of a caution statement, Sirul Azhar Umar told the interrogating officer that he was offered RM50,000 to RM100,000 to kill Altantuya. Is Khalid prepared to have a full inquiry as to how members of the elite police force could be bought to break the law as to commit a cold-blooded murder just for money, and who offered Sirul this money? Is Khalid prepared to defend his police personnel to ascertain whether Sirul and Azilah had gone on a frolic of their own to kill Altantuya with C4 explosives, or whether they were told to do so by very powerful individuals? Does Khalid agree with Razak that this was a "straightforward murder" case? Why then was Deputy Superintendent Musa Safri, the Prime Minister's former aide-de-camp involved? Why were records of Altantuya's going in and out of Malaysia expunged? Was Altantuya was in any way involved with the mutli-billion ringgit Scorpene submarine scandal? Razak was being most insensitive and despicable when he dragged the MH 370 disaster, with the families and relatives of the 239 passengers and crew still grieving at the unfound airline after nearly 11 months, comparing it to the Altantuya murder case. The courts have found Sirul and Azila guilty of Altantunya's murder without trying to establish the motive of the murder. The court of public opinion, in Malaysia, Mongolia and worldwide, expect more – and clearly justice has not been served not only to Altantuya and her families, but not even to Sirul and Azila and their families, when the motive for the murder of Altantuya is not probed and revealed. An all-party Parliamentary Committee to inquire into all unresolved public interest questions on the Altantunya Murder Case when Parliament reconvenes on March 9 will be one follow-up action that could be taken to find answers to the maze of Altantuya questions haunting the nation. The All-Party Parliamentary Committee on unresolved public interest questions on the Altantuya Murder Case is best chaired by an Opposition MP, but if there is any Barisan Nasional MP who is prepared to chair it, I do not see it as a major objection. If the Barisan Nasional government is not prepared to establish such an all-party Parliamentary Committee, then alternatives will have to be explored – for instance a hybrid of a Parliamentary-Civil Society Committee comprising MPs from both BN and PR who are prepared to serve, as well as civil society participation. Ulaanbaatar, February 2 (MONTSAME) A ceremony took place on Monday to lay wreaths to the Statue of D.Sukhbaatar, a prominent political figure and one of the founder of the Mongolian People's Party (MPP) on occasion of the 122nd birth anniversary of him. Present at the ceremony were M.Enkhbold, the chairman of the MPP; J.Monkhbat, the MPP secretary-general; Ts.Nyamdorj, D.Demberel and S.Batbold MPs. Sukhbaatar Damdin was born on February 2 of 1893 in Maimaa town, Ulaanbaatar city. Enshrined as the "Father of Mongolia's Revolution", he is remembered as one of the most important figures in Mongolia's struggle for independence. In 1921, he started the People's Revolution when he was 28 years old. In frames of the anniversary's celebration, an exhibition has opened in the Museum of Mongolian Theatre. In addition, the administration of the city's #2 secondary school paid tribute to the D.Sukhbaatar's statue in front of the school's building. February 1 (Adventure Kicks) Some selected photos from our trips to Mongolia promoting Scottish football and culture. The First historical Mongolia Pavilion at Venice Art Biennale in May-November 2015. Mongolia has many incredibly talented artists. However, they have never had a chance to participate in Venice Biennale. Mongolian Contemporary Art Support Association (MCASA) is organizing the first historical Mongolia Pavilion at this most prestigious international art event - Venice Biennale, from May to November 2015. Besides showing contemporary artworks of Mongolian artists in Mongolia Pavilion for 7 months, we are planning to organize a nomadic pavilion, where the conceptual artist T.Enkhbold will show his performance art in his portable tent "ger" ("yurt") at designated public spaces of Venice as a part of the official Mongolia Pavillion. This show will enable Mongolian artists to present their works in the international art platform. Mongolia opened its doors to the world in 1990 after seven decades of socialist regime. After a decade of transitional economy, Mongolian contemporary artists search at personal and societal levels what it means to be a Mongol in a globalizing world. Contemporary art of the new generation suggests a different shift in the efforts for identity building in contemporary Mongolia – different and distinct, yet representative of transitional time in society in the holistic sense. As Mongols are inextricably linked with environment, this shift exposes a new type of power relations with the environment, and therefore the ways of constructing their own power for survival (by curator Ts.Uranchimeg). MCASA is working to raise the fund to implement this strategically important project. The funds raised through this campaign will go directly to cover the artist's and staff's travel expenses, international transportation costs, the pavilion space and other fees incurred in Venice during 7 months and the production of publication that will ensure the Mongolia Pavilion gets the attention it deserves. Our goal is to raise 200,000 USD. We truly believe that this campaign will unite many people all around the world for exposing unique Mongolian contemporary art to the worldwide audience, and prove that Mongolian art is worth of being shown. We offer our sponsors different types of unique perks ranging from postcard to original artworks by Mongolian artists, your names be published in catalogs and get invited to special art events and tours both in Ulaanbaatar and Venice. MOST IMPORTANTLY, you will be proud of being a sponsor of a Mongolian show, once you start hearing about it from international media and publications beginning from May to November 2015. MCASA will keep informing our sponsors all the news about Mongolia Pavilion and achievements made by artists. In addition, we will send report on budget spending. PLEASE SHARE OUR CAMPAIGN PAGE WITH YOUR FRIENDS! February 2 (The Siberian Times) A mummified monk found in the lotus position in Mongolia is 'not dead' and is instead one stage away from becoming a real-life Buddha, it has been claimed. Forensic examinations are under way on the amazing remains, which are believed to be around 200 years old, having been preserved in animal skin. But one expert has insisted the human relic is actually in 'very deep meditation' and in a rare and very special spiritual state known as 'tukdam'. Dr Barry Kerzin, a famous Buddhist monk and a physician to the Dalai Lama, said: 'I had the privilege to take care of some meditators who were in a tukdam state. Born in 1852, Dashi-Dorzho Itigilov was a Buryat Buddhist Lama of the Tibetan Buddhist tradition, best known for the lifelike state of his body. Ganhugiyn Purevbata, who is the founder and professor of the Mongolian Institute of Buddhist Art at Ulaanbaatar Buddhist University, said: 'Lama is sitting in the lotus position vajra, the left hand is opened, and the right hand symbolizes of the preaching Sutra. 'This is a sign that the Lama is not dead, but is in a very deep meditation according to the ancient tradition of Buddhist lamas'. The mummified remains, which were covered in cattle skin, were found on January 27 in the Songinokhairkhan province of Mongolia. However, there is more to the story and now police have revealed that the monk had been stolen from another part of the country and was about to be sold off. An unnamed official said that it was taken from a cave in the Kobdsk region by a man who then hid it in his own home in Ulaanbaatar. He had then been planning to sell it on the black market at a 'very high price', with local media claiming he wanted to take it over the Mongolian border. Police uncovered the plot and quickly arrested a 45-year-old, named only as Enhtor. According to Article 18 of the Criminal Code of Mongolia smuggling items of cultural heritage are punishable with either a fine of up to 3million roubles ($43,000) or between five and 12 years in prison. The monk is now being guarded at the National Centre of Forensic Expertise at Ulaanbaatar. February 1 (Reuters) - The French director of the film Wolf Totem said on Sunday he had complete freedom from Chinese censors in his adaptation of the Chinese novel, which touches on divisive themes including the degradation of grasslands in the Inner Mongolia region. In China, all broadcast media and films are pre-screened for approval and anything deemed politically sensitive is banned. After Wolf Totem, written by Lu Jiamin under the pseudonym Jiang Rong, was published, some foreign critics pointed out elements that seemed to have escaped the country's censors. An environmental cautionary tale that pits a pack of wolves against an influx of settlers to the grasslands during the late 1960's Cultural Revolution, the 2004 bestselling novel also includes critiques of Chinese culture and governance, and favorable allusions to democracy. Director Jean-Jacques Annaud said while he understood he "may have been an exception", Chinese censors made no modifications to his screenplay. "What I can say is that I had carte blanche at every level until this day. The movie you see is the same movie I cut," Annaud told Reuters in an interview in Beijing ahead of the film's release in China later this month. The book won the first Man Asian Literary Prize in 2007. The author, Lu, a retired professor, has since affirmed he had been jailed for his involvement in the 1989 democracy protests around Tiananmen Square. Chinese officials hope to expand the global imprint of the country's culture and arts and government pronouncements and state media often discuss plans for "cultural reform" to this end. "Definitely, in order to achieve soft power, there will be a need to allow artistic freedom," Annaud said of the development of China's film industry under state censors, adding that he was "not here to give a lesson to anyone". Much like the book, Annaud's approximately $40 million movie, backed by the state-run China Film Group, deals with conservation themes head on, though it largely avoids the book's more subtle political issues. Annaud said that conservation had been one of his "constant preoccupations" as a director. "If we want to save our little planet, we cannot do it without America and without China," Annaud said. Annaud had crossed the Chinese government with his 1997 film, Seven Years in Tibet. That movie depicts a young Dalai Lama, who China says is a separatist seeking autonomy for the Himalayan region. Wolf Totem is set to hit theaters at a time when many ethnic Mongolians say their grazing lands have been ruined by mining and decertification and that the government has tried to resettle them in permanent houses. Minority ethnic Mongolians, who make up 20 percent of Inner Mongolia's 24 million people, are demanding better protection of their lands, rights and traditions. The region, which has the country's largest coal reserves, was rocked by protests in 2011 after an ethnic Mongol herder was killed by a truck after taking part in protests against pollution. In January, another herder hanged himself outside a government building in protest at the authorities' illegal occupation of his grazing land.